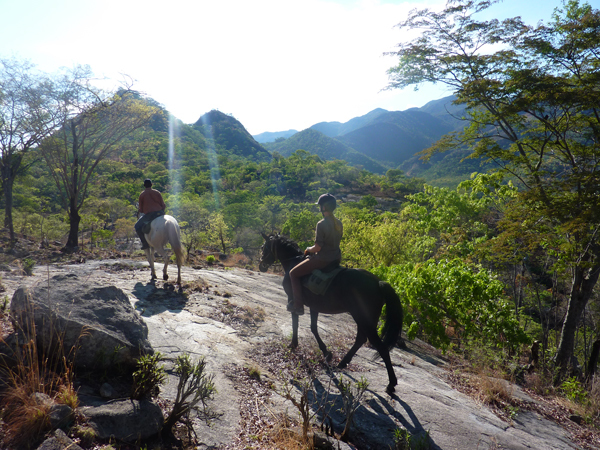 A Canadian horsewoman travels Zimbabwe to explore culture, history and the Mavuradonha Wilderness on horseback! I’d had some trepidation about the prospect of two months in Zimbabwe, Africa. True, I’d been there the previous year on a wildlife safari in Hwange National Park and on horseback no less-- quite a novelty for a rider like me from western Canada. That incredible week in the wild called me back to that part of Africa. I had found an opening in the F.E.E.T. 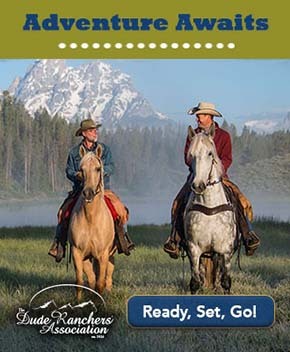 project, “Field Eco-Equestrian Traveler” (including the Trek option for non-riders), a joint venture of Varden Safaris with Horses-in-Africa. 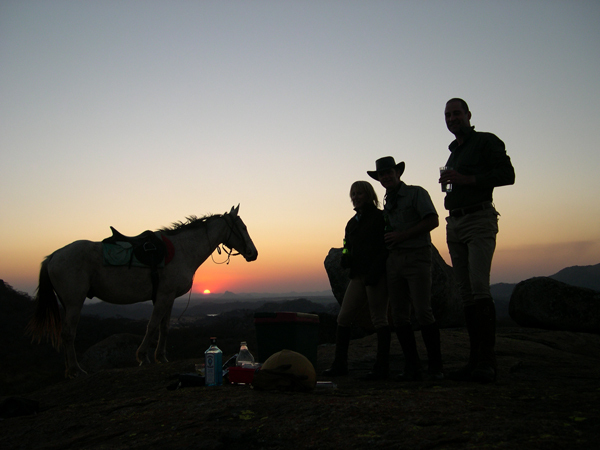 It was an invitation to explore and document the “cultural landscape” of Zimbabwe’s northern bush wilderness on horseback. I had said yes. In the meantime, I’d stayed glued to Zim internet news and read several memoirs by Zimbabweans living abroad that made my hair stand on end, yet strengthened my resolve to go. The Mavuradonha Wilderness in Zimbabwe is remote and not frequently trafficked by tourists. 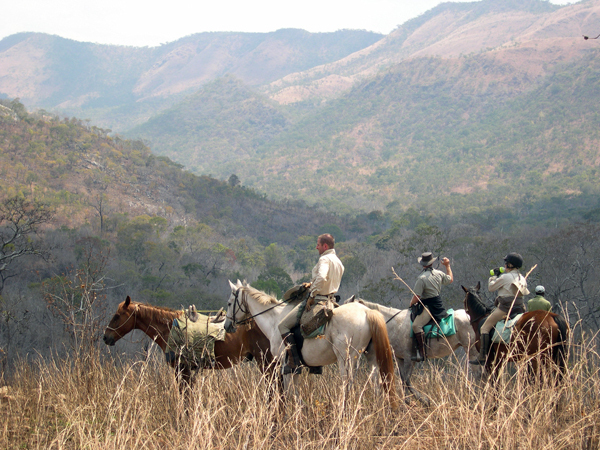 The only way to get around the Mavuradonha mountain range is on horseback or foot. What I found on the ground as a foreign visitor in the country was quite contrary to perspectives from overseas. Zimbabwe is safe and hospitable for travelers with an itinerary or a plan. Since the conversion to foreign currency in 2009, Euros, U.S. dollars and South African Rand are all accepted and have brought the economy out of the desperation that spiked in 2008. Out on the street in downtown Harare, in villages with locals and in bush camp, I experienced no trace of the interracial tension evident in the neighboring country to the south. From my own perspective, the Zimbabwean Shona people with whom I spent time revealed a cultural nature that is inclusive, humble and open. The white Zimbabweans with whom I crossed paths ranged from safari outfitters with gorgeous camps ready for guests, to self-proclaimed racist former farmers, to successful entrepreneurs, optimistic conservationists and a generation of integrated young adults working toward justice and sustainability on all fronts. The journey became in part, an education in social and cultural identity, including deep reflection into my own identity and ancestral history as a Canadian North American. It helps to have an open curious mind, so I stopped trying to make definitive sense of what I came across in Zimbabwe, and instead regarded everyone, every place and every occurrence as elements in a colorful, unfathomable, multi-dimensional collage. An afternoon canter in Zimbabwe with Varden Safaris. Welcome to Mavuradonha Wilderness, “Place of Falling Water” in the Shona language, one of the last intact pristine wilderness areas remaining in the country. Six hundred square kilometers (approximately 232 square miles) of savannah woodland in north central Zimbabwe, bordered by the Zambezi escarpment and river valley to the north, giving way to Cabora Bassa and Mozambique toward the horizon. A privately run wildlife conservation area, the Mavuradonha site is home to many endangered species including African Wild Cat, Serval, Civet, Pangolin, Aardwolf, Southern African Hedgehog, and Genet. Something about saying “Zambezi Escarpment” brings a thrill to my North American heart. 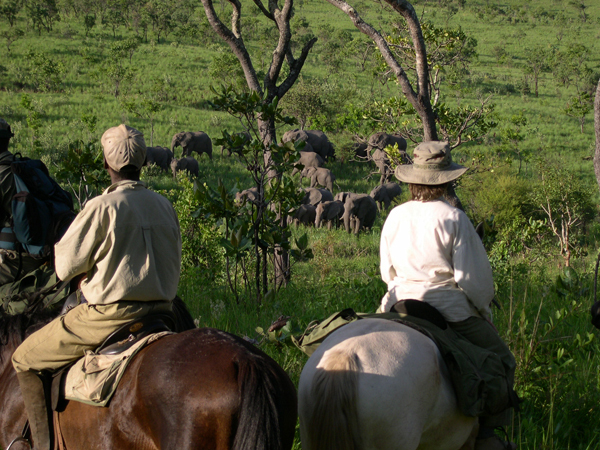 I arrive on horseback into Varden Safaris’ Mavuradonha camp, base for the F.E.E.T. Project. The ride is a stunning initiation into a spirit-filled region unspoiled by transplanted villagers, deforestation, or safari vehicle roads. This is quite simply one of the most gorgeous places on earth in which I’ve had the privilege to feel at home. A place of open flat grassland called vlei, steep hilly terrain, monumental rock faces, waterfalls, river crossings, and wildlife salt pans. Mineral mining operations, however, are a hair’s breadth away from the protected area’s boundary. I walk over that stripped raw land and witness heartless tragedy; trees bulldozed into the Tingwa River bed, a convenient burning ditch, no mind paid to disruption of water to wildlife and village compounds downstream. The red earth literally sparkles everywhere like sunlight on snow, evidence of the mineral treasure below. Trespassing multinational prospectors have been run off the Raffia Palms Botanical Reserve. I was about to be immersed in another world – riding into the intrigue and mystery of this part of Africa, behind the scenes in a place unique on earth. The ancestral history of the people who live here and the integrity of their way of life on the land right now depend on preservation of wildlife and wild places, true everywhere I know. The Mavuradonha Wilderness has been unpopulated since the Bushman and Monomatapa Empires. “Cultural Landscape” is a new and fascinating term to me, a designation assigned by the department of National Monuments & Museums of Zimbabwe. This term defines a marriage of natural history and archaeology with anthropology, sacred sites, routes and traditions. Marvin Mutangara and Douglas Chinhamo are in their mid 30’s and savvy about the realities of sustaining a Cultural Landscape in the 21st Century. The Mavuradonha region is their ancestral homeland. These two Shona horsemen are my guides. Marvin is the F.E.E.T. project director and a world traveller. Douglas is the lead horse handler and bush tracker, rooted here in his family and community. The horses are guides too, in their own way. Surefooted and trained for the bush, some high-spirited and some more down to earth, their instincts were honed in partnership with the humans who care for them. Each has encountered the wild animals of Africa, and I entrust myself wholly to their willing and stable carriage. It is a pleasure to be involved in their daily grooming and feeding. One of the older horse handlers has shown me how to make plied rope with strips of inner bark from the Maputi tree. A necklace of sorts takes shape in my hands; from a circle of slender rope hangs a six inch porcupine quill, similarly sized guinea fowl feathers, various leaves, red stones and dried flowers -- all found on the ground and beautiful constellated together in this way. Ever cautious about misappropriation, I have asked Douglas if I may offer it as an emblem of my respect for nature, the spirit of this place and the privilege of being here. Sundown at the Siya Lima Homestead, a farmhouse where guests may stay while on safari. Tucking it into the pocket of the saddle blanket, we ride to his home village in the expanse of communal land alongside Mavuradonha. His wife is expecting me. Douglas explains to her the significance of the necklace, asking her to show it to her friends as evidence of the value of the land and animals and their unadulterated way of life in the eyes of visitors. His point is that the women will then tell their husbands to take care that no trees are cut down for firewood or animals poached in the wilderness protected area, in what is an unusual gender influence. 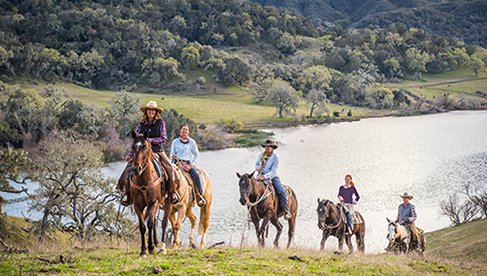 The prospect of encountering wildlife on horseback brings an element of mystery and thrill to riding here. Sightings vary from season to season. We come across a resident herd of zebra regularly, a number of traversing elephants, some exotic native snakes, hyena spoor, stories of recent lion activity, and always monkeys entertaining us in the trees. The Varden’s main enterprise is their legendary week-long horseback safaris exploring the wilderness, either day excursions from Kopje Tops base or camping expeditions further afield in the stunning and diverse African landscape. Early July brings new visitors to camp. The Chief Curator of National Museums & Monuments comes up to Mavuradonha from Harare, capitol city of Zimbabwe, along with the Senior Archaeologist and Chief Information Officer. 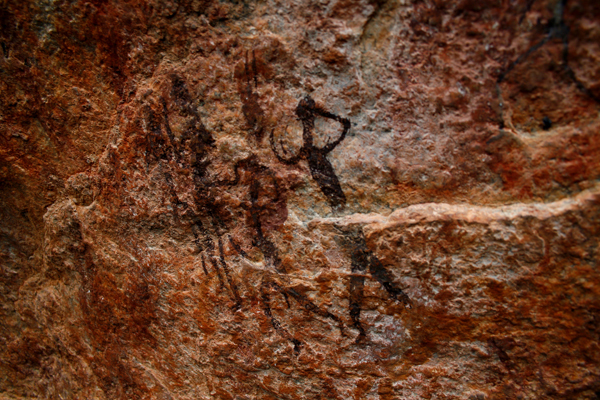 I see rock paintings of zebra and kudu, trance dancing and elephant hunting. I see a whole rock face covered with ochre and brown handprints, behind which are faintly visible images of indigenous life ten thousand years ago -- human handprints, here, in a place of origin. We are standing before a portal, a rock surface where spirit mediums communicated with the unseen world. It is a place of spiritual power drawing humans in succeeding millennia to place their own handprints, “plugging in” so to speak. It makes sense to me. On a horseback safari in Hwange last year, I felt for myself the subtle raw energy of the natural physical world that infuses the body and brain with time in the wilderness. Rock art in the Mavuradonha Wilderness, which is part of Zimbabwe’s successful CAMPFIRE project set up to ensure that the local community gains direct benefit from tourism in their area and therefore recognise the value of wildlife. It is enthralling to learn firsthand that Zimbabwe has the highest concentration of rock art on the planet. Only twenty-five percent of it is explored or documented. Now Mavuradonha Wilderness is on a fast-track to becoming a UNESCO World Heritage site via a collaboration of the Horses-in-Africa project and Varden Safaris with National Museums & Monuments for this purpose. Once heritage status is formalized, the mission shifts to innovative ways, with zero impact on the Cultural Landscape, to uncover new knowledge in anthropology, archaeology, botany, ornithology and as yet unknown treasures in this wilderness preserve. As well, when protection is ensured, animal restoration can begin in earnest, supported by the “zero impact” principle, keeping the area accessible only by foot or on horseback. I end up staying in Zimbabwe for three months, including a side trip to the Chiredzi River Conservancy in the southern Lowveldt. The Vardens had taken an orphaned baby elephant there from Mavuradonha, to make her home with three rescued adults and a herd of ten horses. Each morning of my two-week stay, we ride the elephants from their nighttime paddock out to the daytime grazing grounds. I sit astride Chitora just in front of her shoulders with her huge ears blanketing my legs. The rhythm of her slow momentous gait remains in my body long after I say good-bye to her. 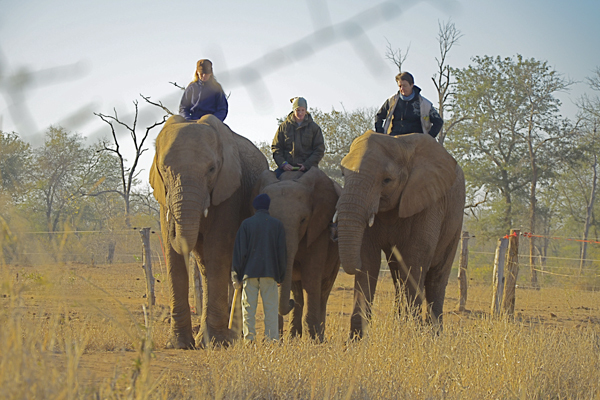 The author riding elephants in Zimbabwe with Heather Brand and Theresa Warth. Returning to Mavuradonha, it is only toward the end of my stay that it dawns on me I’d been the sole foreigner most of the time, and a mid-life white woman at that, riding with Shona horsemen, eating sadza by the cooking fire and sitting in sacred places on the land. Neo-tribal, Marvin calls it, such was the sense of inclusion and involvement in the mission of ethical custodianship. The welcome mat is out for anyone with a sincere desire to ensure that Mavuradonha remains a self-sustaining cultural landscape; our being there acknowledges the value and brings revenue to the cause. This is one place where I feel that my presence contributed to its integrity rather than detracted from it, and does not commodify the natural order of things. Watch Oriane's photo montage from her experience as a volunteer in Zimbabwe and on a horse safari. Passing through Harare between forays into the wilderness, the perfect guest house welcomes me each time I reappear. The Borrowdale Country Manor, on the outskirts of town, is a secure, comfortable, modestly priced sanctuary with quiet location and restful gardens. There is a private stable and riding arena on the grounds. It is beautiful to watch the horses training on the jumps in the pasture. I will be back again next year, planning my visit around H.I.F.A., the acclaimed Harare International Festival of the Arts – yet another reason for returning to Zimbabwe.